Does anyone love mowing the lawn? Do you think it’s a chore, or something you find quite relaxing to do? 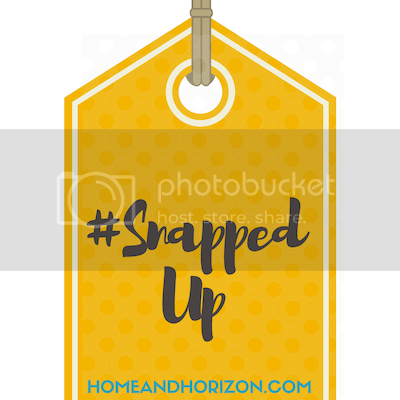 Well I am showing you a product that you are going to love either way! I love cordless products, and I am slowly bringing more and more into the house. Technology is becoming so much more advance that the batteries are getting smaller, less heavy and charging times are getting shorter. 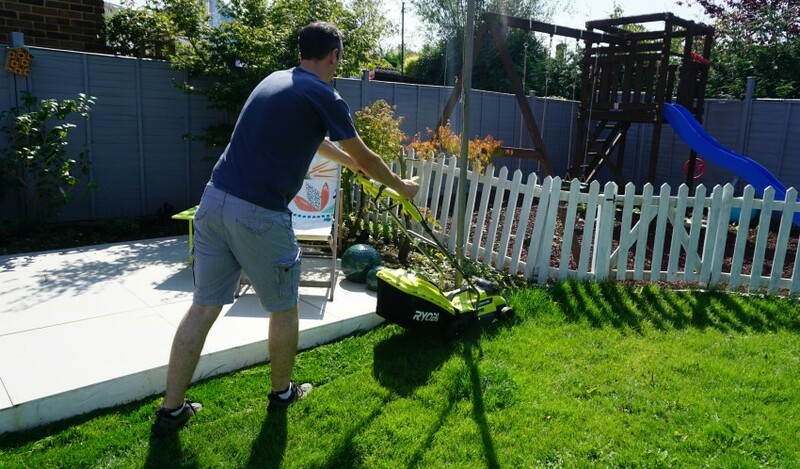 So when Ryobi offered me the chance to try out their cordless lawnmower I thought what a great product to have cordless! 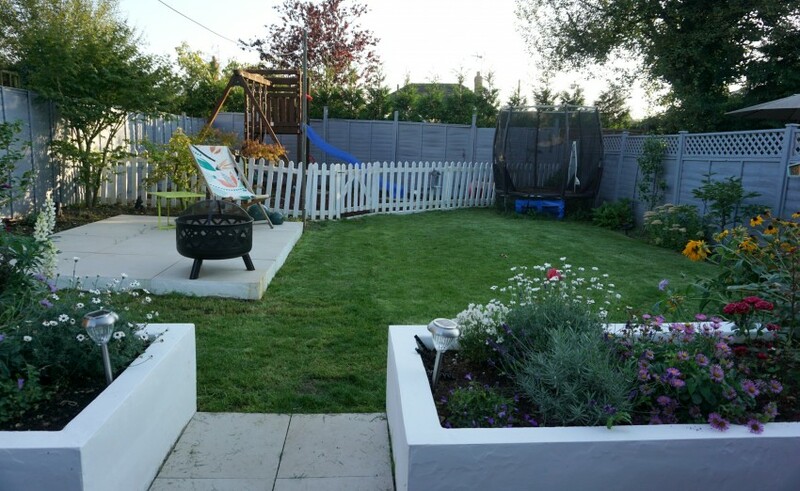 I have always worried about mowing the lawn, remember my Dad always having a circuit breaker plug in the kitchen whilst he cut the lawn. Throwing the cables over his shoulders to keep it out of the way. I still worry about Hubby cutting the cable now! 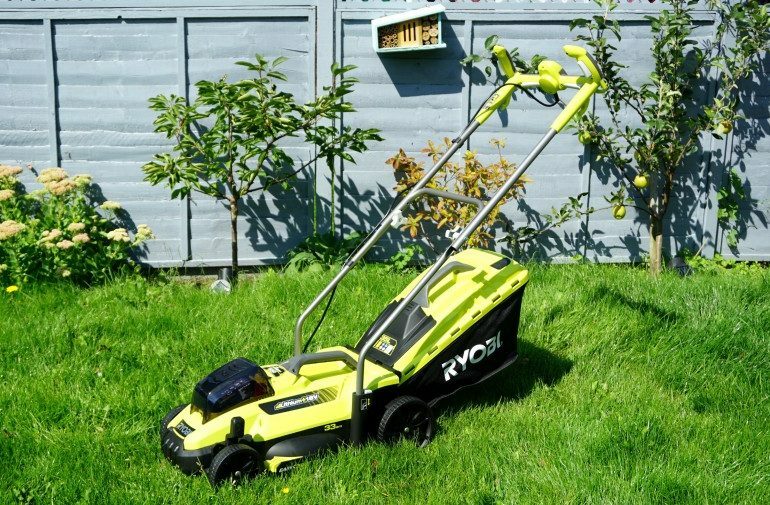 Not a problem with the Ryobi Cordless Lawnmower, there are no cables, so no worries! My son even was able to have a go! What a great lawnmower! We arrived home from our holiday and the grass was SO long! A perfect opportunity to put it to the test, and give it a challenge! It performed great, cut well around the edges, and did the job very well. 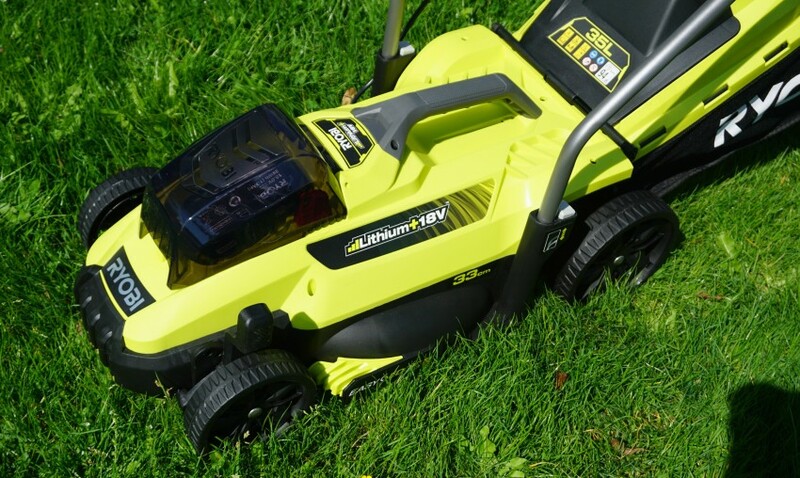 The lawnmower doesn’t come supplied with a battery, however these can be purchased separately. 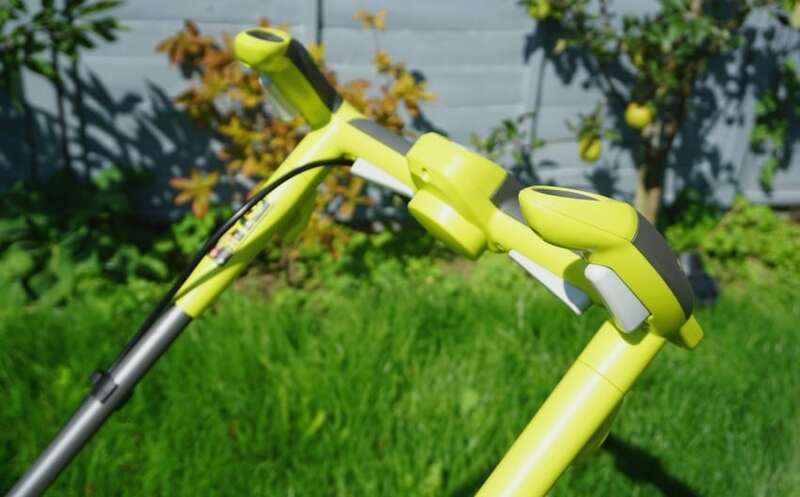 Although the beauty of the Ryobi ONE+ range, is that the one battery can be used in their full range. You can set up a little charging station, and have a battery ready to go when needed for all the tools. Either if your drilling, cutting the hedge or mowing the lawn. The battery can be used for all of the jobs. It is easily changed, and hidden under this black box on the top of the mower. The batteries come in different amp ratings, and we used a 4.0Amh battery for the lawn mower, however when using the Ryobi drill for my office noticeboard we used a 1.3Amp battery. The grass cutting bag is a great size, easily held a great amount of cuttings. As it is made from canvas, it folds down nicely for storing. If a product has to hold a battery it usually means that it will more heavy than the normal products, so I was interested to see what it was like to push around, and lift about. No worries! It was really lightweight, easy to carry and with 4 wheels there wasn’t any problems pushing it around the lawn. It’s lighter than our old corded lawnmower! 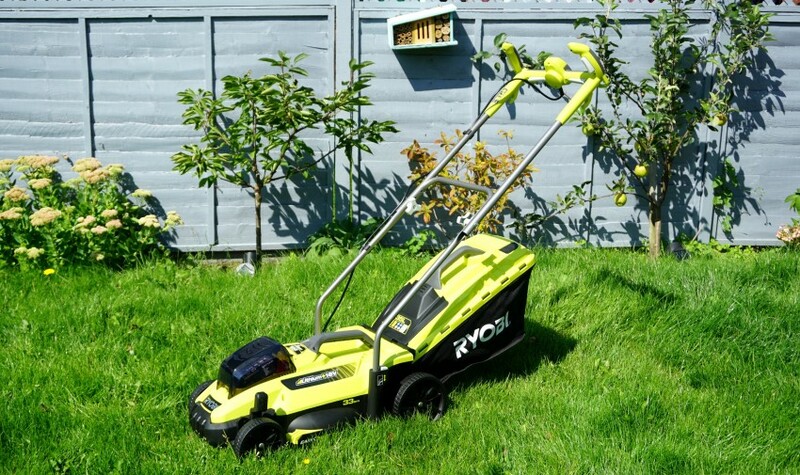 The Ryobi Cordless Lawnmower is priced at RRP £149.99 (check for offers at the time) I think it is a really good price, I know of other cordless lawnmowers that are much more expensive, so this is very well priced. They also have some good packages that include more cordless products like strimmers. Head over to Ryobi Facebook page to find out what other great products you can use the ONE+ batteries with. The list is endless! 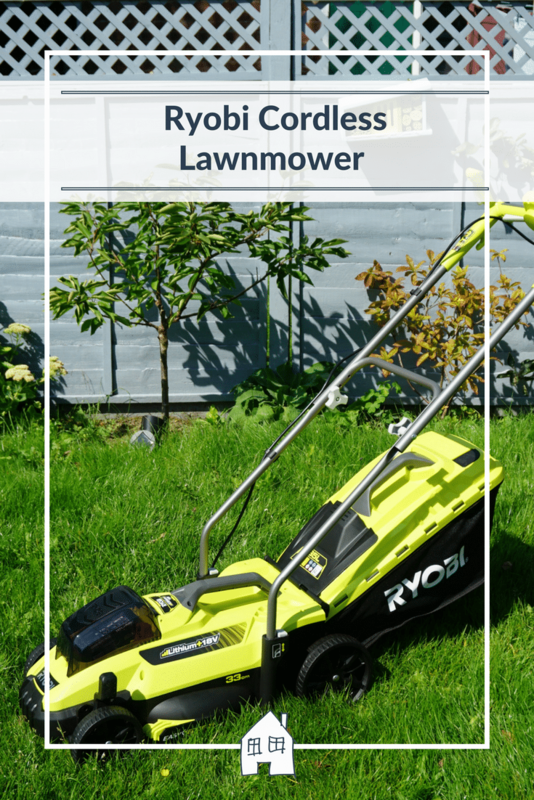 *I was sent the Ryobi Cordless Mower for the purpose of this review. However all opinions and words are honest, and of my own. Post contains affiliate links. Sounds like you need a ride on one!! My husband ran over the cord of our new lawnmower the day he bought it! This would have been a much better idea for him. Oh no, I hope he was OK. Yes this would have been perfect for him! Cordless sounds like a much better idea. 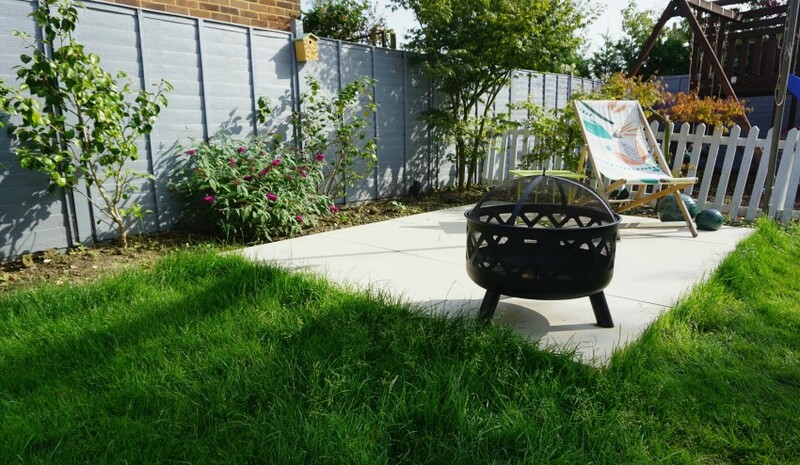 Luckily we have artificial grass so no hassles with grass cutting! Loving the colour of this lawnmower. 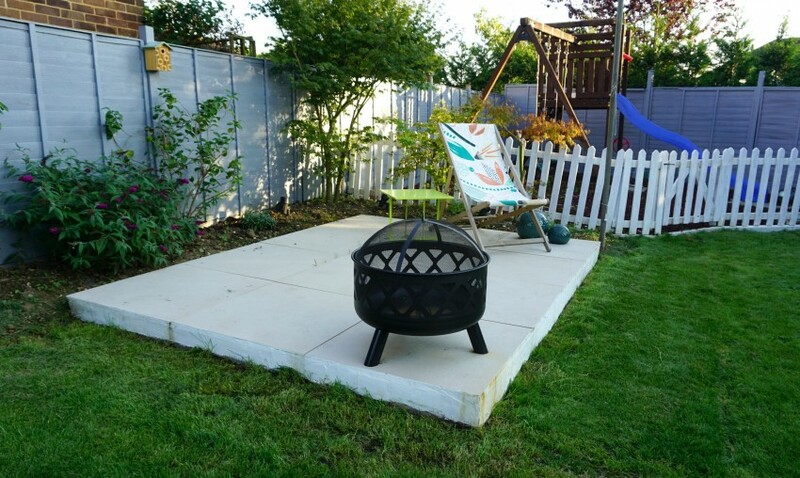 Perfect matches your garden. Yep perfect colour for the garden! I like the sound of this cordless lawnmower. Looks great too. It does the job great so were really pleased, thanks glad it looks nice! Yes that would be much easier with a corded one wouldn’t it. That would definitely be a safer option for me. I’m such a clutz where wires are concerned! It solves a lot of problems doesn’t it with cords and ease. Hubby would hate to go back to a corded one now!! Wow a cordless lawnmower how amazing! There is nothing more annoying than the lead getting in the way plus we have to use an extension too so this sounds hugely appealing! Oh I would love one like this! The cord drives me crazy, I’m always paranoid about running over it! Think the cordless tech is getting better and better isn’t it. I love the sound of a petrol mower though! A cordless Lawn Mower, I never knew such a thing existed until now. My partner is always having to unplug the internet and tv when he wants to cut the grass, as we don’t have enough plugs . I’m going to show him this to hopefully help us both out lol. Fantastic idea isn’t it, that would help you both out wouldn’t it!! This post couldn’t have come at a better time. Mine packed up at the weekend so will be giving this a look! Yes do check it out, so much easier to use than a corded lawnmower!